April has once again been declared Grange Month by the National Grange, who recently announced the 2011 theme: Connecting Communities Through Service. While April may seem like it’s a world away- it really is right around the corner. What better time than now to start planning for Grange Month activities in your Community Grange. 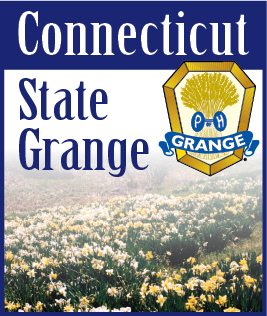 The Connecticut State Grange has a number of events already in the works, including a fun and exciting Grange Rally on April 3rd titled “Membership is Serious Business… Seriously” and a Mystery Night on April 30th at Cheshire Grange, as well as the “Bowl Across America” fundraiser, and a clean-up day at Camp Berger on April 23. Community Granges are encouraged to celebrate Grange Month with open houses, lectures and programs, citizens’ awards, service projects, community displays, traditional potluck suppers and more. National Grange will soon be distributing packets promoting Grange Month. The Public Relations Committee will also be distributing information this February to each Community Grange to help in their Grange month promotions. The PR Committee is here to help each Grange promote their events - all you need to do is ask!